It is hard not to be moved by the images from St. Peter's in these last days. Italian authorities estimated that nearly 100,000 people were gathered at St. Peter's when the Pope went home to God at 9:37 pm on Saturday evening, April 2. The emotions on the faces of the faithful ranged from joyful to sorrowful to peaceful and hopeful. And so, like sheep without a shepherd, we join Catholics around the world who mourn the death of the Holy Father, John Paul II. For over 26 years, he faithfully guided the Church. For many, he served as the only moral authority left in the world often enshrouded by the darkness of the culture of death. 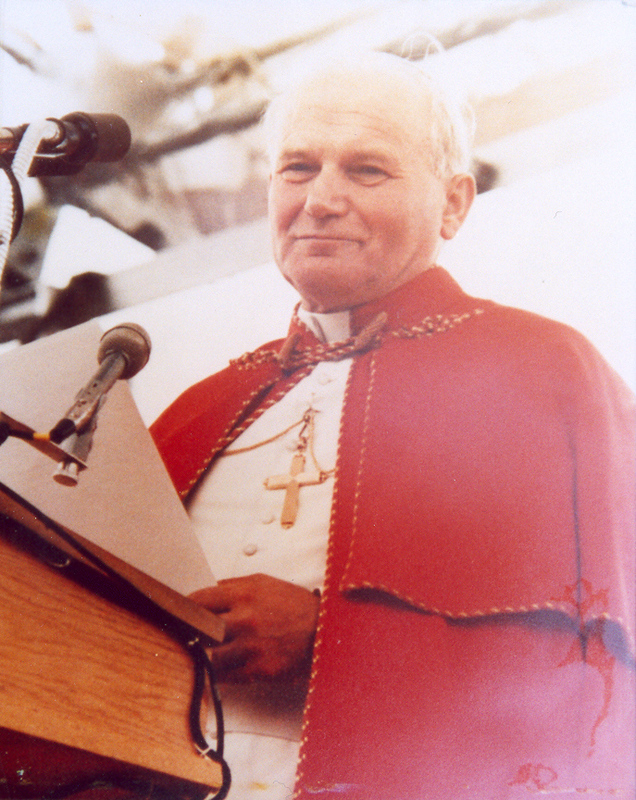 John Paul II brought together disparate groups - capitalists and communists; Jews and Moslems; rich and poor. And yet, even now, he transcends all of the popular media spin that we have watched these past few days, which attempts to label this great Pontiff with convenient terms like "conservative" or "liberal," John Paul II fits neither of these categories. Rather, he lived a life based on two convictions: first, that Jesus Christ is the Son of God who died for our sins and second, that He rose from the dead and now sits at the Father's right hand. All that the Holy Father did - from the moral to the political to the doctrinal to the pastoral, wasn't about "conservative" or "liberal." Instead, it was faithful discipleship and obedience to the Tradition given to him through the Church that gave meaning to his Apostolic life. It was an intense love for Christ that was at the heart of how he lived and led us - not political calculus or popularity as the pundits would have us believe. How fitting that we celebrate and remember his rich life on this day of the Year of the Eucharist. The Pope returned to His Father's house at the end of the octave of Easter, on the vigil of the Feast of Divine Mercy, a devotion that he popularized some years ago. The timing of his death teaches us to hope in the Resurrection and to trust in the power of God's mercy. On Monday, we will celebrate the Solemnity of the Annunciation, when Our Lady accepted God's invitation to be the mother of His Son. Similarly, John Paul II accepted the papacy in 1978 by making the motto, "Totus Tuus" - meaning, "(I am) all yours," entrusting His papacy to our Lady. The timing of his death also has significance in relation to the death of Terri Schiavo earlier this week. The Pope's own death reminds us that the weak and feeble are to be treasured to the very end, not because of what they can do but because THEY ARE. Human life has an inherent dignity and it is not to be judged as worthless based on arbitrary claims of "quality of life." Our country should shudder with shame at how we allowed an innocent woman to die - to be starved to death under the guise of mercy! This was not DIVINE MERCY. Rather, it was death by convenience - a sad by-product of the culture of death, so embedded in our society that we have yet to decide that it is truly wrong to kill human beings. Perhaps the Pope, in his death, will awaken our nation to realize that what happened in Florida these past few weeks was a great injustice and one for which we will pay dearly in the end. God will not be mocked! Appropriately, many are now calling John Paul II, John Paul the Great. This Pope revolutionized the Papacy. He traveled more than all of his successors combined; he canonized saints of every walk of life; he appealed to the youth (and they to him) and he brought the Gospel to the world through his Apostolic visits and through his brilliant use of the media. The length of his reign has meant that he has been the only Pope that many Catholics have ever known (myself included). His image has become synonymous with the Papacy itself. I will never forget the day in January 2000, at the beginning of the Jubilee Year, when I had the distinct privilege of meeting Pope John Paul II. As I knelt before him to kiss his ring and offer my respect and admiration, I knew I was in the presence of greatness. I had this sense, not because the Pope was a highly educated man who spoke 8 languages or because he was the head of the world's 1 billion Catholics, or because he was the man who is prayed for at every Mass in the Eucharistic Prayer, or even because he was instrumental in dismantling communism. Rather, I knew I was in the presence of greatness because I was kneeling in front of the Vicar of Christ and more than that - a true Apostle - Peter himself! I felt an instant connection to Christ because here in front of me, hunched over, and looking a little tired, was God's anointed one - the one chosen to ensure that the fires of hell would not prevail against the Church. The entire world now watches the days of mourning, the funeral and the selection of the next Pontiff. These days will be ripe with opportunities for us to speak openly about our Faith because the entire world is watching. May we honor the life of John Paul the Great by continuing his legacy of evangelization so as to usher in the new Springtime of the Church. Inspired by his life, may we heed the words he first spoke to us as Pope in 1978 - Be not Afraid! We are unafraid because we know that our Redeemer lives - that there is glorious resurrection beyond the grave - that good triumphs over evil - that life conquers death and that we ought to rely on divine mercy as our passport to eternal happiness. Only Divine Mercy can truly heal our wounds and repair the divisions in our world - in our family; in our Church; in our nation; and in our hearts. The Holy Father has gone on how before us to his eternal reward. He belonged to our Lord and our Lady and not to Himself. Entrusting ourselves to Jesus and Mary, may we strive to serve them as the great love of our lives, Just as the Holy Father did in his own life. The Italians say that the angels fly a little lower at St. Peter's and in these days, I think they're right. May the angels come now take His Holiness to our Lady and our Lord, whom He served so faithfully throughout his lifetime. We express our love for this Pontiff through our prayers - he who has loved us so much through all of these years. Eternal rest grant unto him, O Lord and let perpetual light shine upon him. May he rest in peace. Amen. And may his soul and the souls of all the faithful departed, through the mercy of God, rest in peace. Amen.